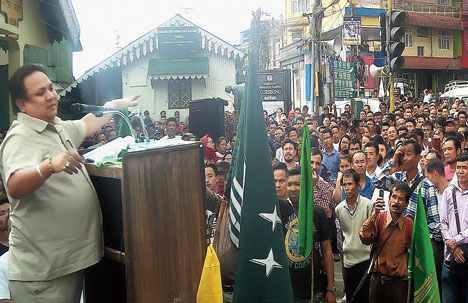 Darjeeling: The Gorkha National Liberation Front held a public meeting at Kurseong on Sunday, exactly a week after the Gorkha Janmukti Morcha did so at the same spot, and accused its arch-rival of "betraying" the hills on statehood. The GNLF launched a vitriolic attack on Morcha chief Binay Tamang, who had at last week's rally criticised Mann Ghisingh, the GNLF chief and party founder Subash Ghisingh's son. "Binay Tamang had said our president got the post like in a dying-in-harness case. Okay, we accept that argument but what about them (the Morcha)? They, too, have come into the GTA on a state government quota for betraying the hill people. They are there in the Bengal quota also," senior GNLF leader Niraj Zimba, the main speaker at Sunday's event, said. Tamang had made the "dying-in-harness case" reference to insinuate that Mann had got the GNLF chief's post only because he was Subash Ghisingh's son. On Sunday, the GNLF, which recently walked out of the state government-formed Hill Area Development Committee, made it clear that it was trying to reposition itself as a party that will carry forward the aspirations of the hill people. "They (Morcha) have made it clear that they will not support the BJP as they (the BJP) have betrayed the Gorkhaland demand. We want to ask which party they (Morcha) will they support in the upcoming Lok Sabha (polls in 2019) for Gorkhaland?" Zimba asked in comments seen as a clear attempt to connect with the statehood demand in the hills. The GNLF has been pitching for implementation of the Sixth Schedule in the hills, which will allow the region more autonomy. The party sees the status as a stepping stone to statehood, and Zimba on Sunday appealed to all hill parties, including Tamang's Morcha rival Bimal Gurung who is on the run after facing violence cases, to support the demand. "Do not support the GNLF but lend your support to the Sixth Schedule demand," said Zimba. At last week's rally, Tamang had slammed Gurung and highlighted projects undertaken by the Gorkhaland Territorial Administration. Tamang has been heading the hill body since September 2017.